Is your dream to have a home among the gum trees? With lots of plum trees? How about the next best thing instead? You could think of it as an exceptionally large swimming pool to cool down in or an outback retreat to spend a hot Summer weekend at. Either way, Lake Leschenaultia has something for everyone. The list of activities on offer and ways to spend your days are endless. 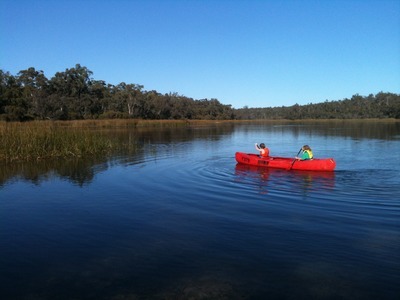 If you are an athletic, energetic person you have the option of going canoeing, swimming, bush walking or all three. For those nature lovers, take a three kilometre stroll around the border of the lake and experience first-hand the amazing variety of native trees, flowers and wildlife. If you are a beach lover, the shores of the lake resemble the sand found at the most popular Perth beaches but the calm cool water gives you the opportunity to relax. For those who want a weekend getaway, why not camp overnight and make the most of the barbecue, toilet, shower and washing machine facilities provided. Whatever your calling, the Lake promises to provide you with a memorable experience that is as close to the nature of the great Australian outback as you can possibly get. You might even see a sheep or two or a kangaroo. Why? 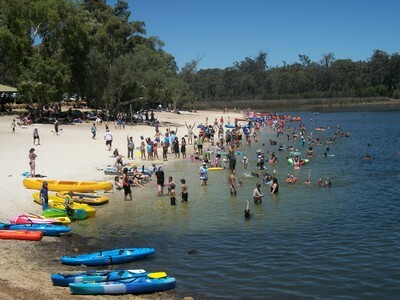 Lake Leschenaultia has something for everyone.